Sure, sea ice is shrinking in the Arctic, but it is growing in the Antarctic. Sounds like natural fluctuations that balance out in the end. Overall, it is true that sea ice extent in the Antarctic is increasing. Around the peninsula, where there is a lot of warming, the ice is retreating. This is the area of the recent and dramatic Larsen B and Ross ice shelf break ups. But the rest of the continent has not shown any clear warming or cooling and sea ice has increased over the last decade or so. This is not actually a big surprise. In fact, it is completely in line with model expectations that CO2 dominated forcing will have a disproportionately large effect in the north. The reasons lie in the much larger amount of land in the northern hemisphere and the fact that the ocean’s thermal inertia and ability to mix delay any temperature signal from the ongoing absorption of heat. The local geography also plays a dominating role. The circumpolar current acts as a buffer preventing warm water from the tropics from transporting heat to the south pole, a buffer that does not exist in the north. You can read some more details about that here. Does it "balance out in the end"? Not really, sea ice in the Arctic is reaching dramatic record lows There are other components of the cryosphere that we can look at as well, permafrost, the Greenland ice sheet, global glacier mass, and these all carry the Global Warming signal. One must look at the balance of evidence, not just those bits one likes. And this balance is clearly in agreement with all other indicators that warming is real and rapid. “Antarctic Sea Ice Is Increasing” was first published here, where you can still find the original comment thread. This updated version is also posted on the Grist website, where additional comments can be found, though the author, Coby Beck, does not monitor or respond there. Well, well, well Coby another IPCC prediction bites the dust, Not only did Antarctic ice levels reach all time highs but so has the Antarctic. Is this were you trot out that old chestnut that global warming causes global cooling or is there another profound theory being written as we speak? Well, well, well Coby another IPCC prediction bites the dust. Not only has the Antarctic reached record high ice levels but so has the Arctic, is this were you trot out that old chestnut global warming causes global cooling or is there another profound explanation being written as we speak? I didn’t realise that predictions which are, in fact, fulfilled are somehow “bit[ing] the dust”. As a side note, you don’t quite get how this works, do you? Is the idea that increasing atmospheric heat contributes to shifting wind and weather patterns, and changes in ocean circulation as heat finds its way into the water, and this gives rise to LOTS of different local and regional effects, just too big and too difficult for you to grasp? Yes the IPCC did state this in 2001 so why does Al Gore and his minions of wannbe scientists continually state the nth pole will be ice free in 5 years? Would it be too hard for these people to stick to the facts? Or do they enjoy embarrassing themselves by making stupid predictions. Also another prediction is that WHEN the ice sheets melt the Earth will lose some of its albedo effect which will in turn warm the Earth, which in turn melts more ice, which in turn warms ….well you get the picture. So what you are saying is (and according to the IPCC) this theory is totally incorrect, if so why do we (the general public) get bombarded by this type of rubbish science? As a side note, way back when it was AGW (at least before 2001) the statement WAS made that the ice caps will melt the prediction was proven correct by Arctic ice melt albeit during summer, it was then pointed out that the Antarctic had gained in ice. This lead to the profound statement that AGW causes global cooling as well hence the name change to climate change. So according to the IPCC the nth and sth poles will continue to increase in ice due to global warming, which will increase the albedo of the Earth. Unless i am missing something does this mean we are now heading into an ice age? Just to prove the IPCC theory New Zealand 2008 was its coldest year since 1867, thats 141 years and i know its only weather. I can think of something else that can do this, its called Pacific Decadal Oscillations or PDO, and AMO or ENSO. How about La Nina and El Nino, these two events shift the wind and weather patterns. The PDO etc occurs about every 30 years for example 1940 to 1970 (30 years cooling) 1970 to 2000 (30 year warming) 2000 to ???? is it coincidence that the Earth has now cooled somewhat? Thanks for your post Luna, it is good to have a decent debate rather than arguing over the semantics. Here is an example of what i am talking about, according to Jim Hanson we have four years to avert danger, but notice what he says about the ice at the poles. This is in complete contradiction to the IPCC report you referenced. So who is right? which prediction will fail? and who are we supposed to believe? Yes, you’re missing something. Like, facts, for example. That is, the website of the National Snow and Ice Data Center. OK, So is the Antarctic melting or not? Antarctic sea ice remains slightly above the 79-00 average this year, the general trend is negligible. I am not sure what the latest findings on ice sheet mass balance are. The IPCC has stated the “models” show global warming will be first seen at the poles (re polar bears dying)temperatures will rise and ice will melt. Unfortunately (for the IPCC)this climageddon scary story has not occurred. Yes the Arctic summer ice melt of the past two years has been above normal which alarmists have pointed to as evidence GW is real. Unfortunately (for the IPCC) the winter freeze has continued along well within the long term average. In fact this winters freeze has been extended by a couple of weeks to date. In regards to the Antarctic, the Antarctic has shown no signs of GW what so ever, in fact the winter ice extent of 2007 was of record proportions. One study to try to explain this stated that GW is causing it to cool. Hence the name change from global warming to climate change. This lack of warming has been a thorn in the side of the IPCC for many years so Mann and two other scientists of questionable integrity came up with a study which showed the Antarctic was warming and melting. This study was disputed by members of the IPCC and lasted about 5 minutes before it was shredded, pulped and then burnt. To sum up the worlds mass ice sheet has continued along its merry way well within exceptable limits of the long term trends, like as if GW did not exist. Correction: Polar temperatures ARE increasing. It’s where he gets all his best stuff… bought and paid for by Exxon Mobile. Crakar, congratulations on a 100% fact free posting. Not one sentence was true. Feel free to quote something from the IPCC to back up what you said they said, you can not. The rest is similar fabrication. To take up your challenge in regards to what the IPCC said or did not say Coby, the following statement needs to be addressed. Here is the proof that they said what i said they said. One of the first to express astonishment was Dr Kenneth Trenberth, a senior scientist with the UNâs Intergovernmental Panel on Climate Change (IPCC) and a convinced believer in global warming, who wryly observed âit is hard to make data where none existsâ. I believe you owe me a beer Coby. 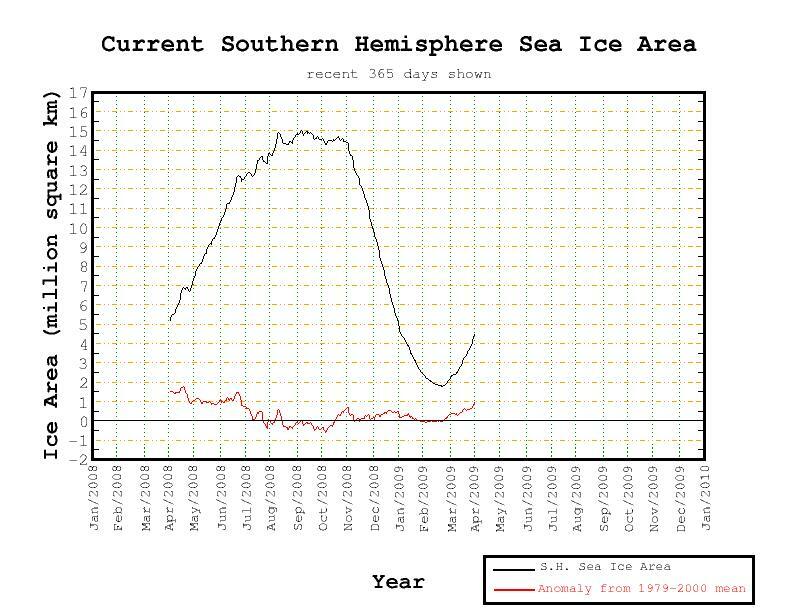 So the Antartic recorded its highest sea ice extent ever in 2007 and this was caused by what? GW? I put some water in the freezer to simulate Antarctic conditions and the water froze. I then put the ice in a pot of fresh water on the stove and i turned the stove on and the ice MELTED. I did the same experiment with varying rates of temp increase and the ice MELTED. I even played with the salinity of the water (Saxa table salt) and no matter what i did the ice MELTED. At now time did the ice crack, split or break into two pieces. I think some one should tell that simpleton, pathetic excuse for a politician how ice bergs are made. And since ice bergs have been around for a very long time (re Titanic)i suggest this break up of the Wilkins ice shelf has nothing to do with increased CO2 levels in the atmosphere (GW). Would anyone care to differ? Basically this scientist is full of crap and his own research proves him wrong (but hey it worked and he got his name up in lights) in the end his groups research shows the sun plays a large role in sea ice extent. Here is another experiment you can try: lower your freezer to -20oC and put some water in, in a tray. After the water has frozen, turn the temperature in the freezer up to -15oC. Report back to us if the ice melts. I have better experiment you can try. Buy another refrigerator for the basement and perhaps one for the garage. Turn all the refrigerators on and wait. Report back if there is flooding in Bangladesh. Coby if the freezing point of water is say zero degrees C then i would speculate that at -15C the water would still be frozen. When you consider that since 1979 the global temps have risen by 0.2 to 0.4C (depending on which UAH or RSS figure you listen to as divergence is different through different data manipulation)it would suggest as you have pointed out that the temps would not be high enough to melt any ice let alone make it snap off. Therefore this is just another pi$$ poor attempt to scare people into believing GW simply because the theory is untested and there is no proof what so ever that for every extra molecule of CO2 released it will cause temps to rise to the point of climageddon. You do realize, I hope, that it is the selfish, greedy, non-caring, wealthy, Rush Limbaugh listening, strawman argument using, goal post moving, ignorant, uneducated, gas guzzling, multi-appliance using, Republican AGW denier that is both causing AGW and preventing it’s demise don’t you? And you do realize, I hope, that among other things, AGW will undoubtedly result in more frequent and intense flooding in countries such as Bangladesh don’t you? And you do realize, I hope, that people with more than one refrigerator, perhaps such as yourself, should be held not morally but legally responsible for causing such flooding…..and in turn, should be forced to compensate those countries for their personal misdeeds don’t you? And you do realize, I hope, that if an attempt at levity (as in #16) has to be explained to someone, such as yourself, who feels a need to pretend he knows about such matters….than there is no hope…. don’t you? You know what really makes someone investigating the science lean more and more toward the skeptics viewpoint? I have a pretty good feel for this because I actually began studying this whole issue about couple of years ago with no preconceived notions. The more I read however, the more skeptical of the GW agenda I became. Some of the things that initially made me skeptical had more to do with the tone of the human caused GW believers than anything else. -Referring to a skeptic as a ‘denier’ makes any fair-minded person wonder why a GW believer feels the need to imply that there is no debate, and that the skeptic is ‘denying’ rather than questioning the science. True scientists will gladly argue the science without feeling a need to denigrate the other person or claim that they are ‘denying’ the truth. Doing so appears to expose that there is a significant weakness in the GW argument. – In a similar manner to the first point, inevitably, if a debate continues, at some point in the discussion, the GW believer will bring up Exxon (as though they just mentioned Satan)while ignoring all the funding supporting their side. You seldom see a skeptic bring up Enron or GE, when both were/are huge supporters of the GW agenda for their own purposes. This too makes any fair-minded person wonder about the motivation. -Bringing up Rush Limbaugh or some other controversal conservative when things really get out of hand, as though that settles the debate, doesn’t really sway anyone interested in the scientific facts. -The suggestion that instituting a new worldwide tax scheme (obviously by another name), will save the world from global warming makes a fair-minded person wonder how quickly the whole issue would disappear if those promoting the idea weren’t allowed to benefit from the tax. -The continuous attempts to silence the opposition instead of simply proving them wrong makes someone investigating the issue suspicious. Why for instance, did the IPCC choose the studies of carbon levels in the 1800’s that discounted all readings that were higher than they are today when there were thousands of samples that showed higher levels using similar science? -The exaggeration of the science that supports GW (read Al Gore type ‘documentaries’)may backfire. If the science was solid on it’s own, no one would need to exaggerate it. After suspecting the science was weak, I spent thousands of hours investigating it, and I’m now firmly in the camp of the skeptics. But I thought those on the other side, might be interested in how early in my investigation, their own actions had the opposite affect of what they intended. GrecRI, I could not have said it better myself. To Betula, i dont quite understand your post, are you trying to take the pi$$ out of me or the AGW church members? I am not of the AGW religious persuasion. #16 was a joke at the expense of alarmists. #18 was a sarcastic and painful explanation of the joke. You are trying to prove wrong a science that speculates future events based on probabilities. You can’t prove wrong a speculation. Furthermore, you feel the need to present your case to an AGW congregation that has been recruited with a doctrine of fear based on a bible written by AGW prophets and Apostles. Camille Paglia (a liberal Democrat) recently wrote something that, I believe, fits into this catagory….. Though this statement is political in nature, it seems to correlate with the mindset of AGW alarmists. I believe it also gives us a hint into the real motive of AGW theorists…….government power…….. the government power needed to help poor nations by balancing the distribution and costs of world economic growth. But I digress. Anyway, my take isn’t to argue unproven speculations based on skewed probabitities, but rather to point out the absurdity and hypocrisy of the tactics and actions used to indoctrinate the masses into a phobia based conclusion. For example……look at this recent article…. You see, the situation is so “Dire”……we can only drive the point home by proving that we have lost our minds. I don’t know about you Crakar, but I just soiled myself and think we better start shooting pollution pell mell into the atmosphere right now before I run out of a clean pair of pants to wear. If the situation were so “Dire”…..would it not make sense to rid the world of all our C02 emitting luxuries such as luxury Cruise liners, motor sports, recreational vehicles, vacation traveling, air shows, theaters, carnivals,fairs,theme parks, sporting events (paricularly night games) and anything else that has to do with C02 emitting leisure,luxury,recreation and sport? Not to mention all the wasteful extra washes needed to clean our pants. Wouldn’t you agree that all these things are completely unecessary and trivial when compared to the end of the world as we know it? These drastic times call for polluting the Atmosphere to save the earth from the current cooling trend which indicates climate change as a consequence of global warming which was created by man by polluting the earth with C02. So you see Crakar, there is and never will be and end game written on these pages…..it would be like people with dementia finding a cure for dementia. GrecRI, I agree completely, I made this point a few times on other parts of this web site and was greeted with the usual scorn, sarcasm and avoiding the issue. The rhetorical posture alone makes one skeptical and desirous of reading more of the science. The only conclusion an objective mind can reach is this is far from settled and the thought that new taxes and regulations will have any effect is absurd. As this thread relates to Antarctic sea ice, below is a link to a recent study addressing Ice Calving. It concludes that the rate of growth and thickness determines ice shelf stability. Hence rapidly growing, large ice shelves tend to break; they are ice SHELVES after all. No indication that co2 causes this rapid growth. The expansion of Antarctic sea ice has long been a staple of climate change deniers – using it to claim that the climate cannot be warming because more ice must mean cooler temperatures. Essentially they are attempting the magician’s trick of distraction – they want you to look over here (at the Antarctic) to avoid you seeing what is happening in the Arctic. Any denier want to spin that one?